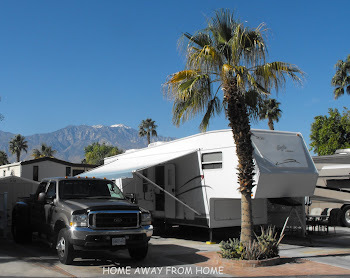 We love RV'ing and wish to welcome you to the world of RV'ing in the world of blogging ! Keith and I have been RV'ing for many years now, both for work and for play. Play is the obvious favorite but until retirement allows for more play, we will still be spending many months of the year in the rv for work purposes. More often than not, Keith is living in the RV alone as he is usually working in fairly remote areas, including gravel pits with no cell service, let alone internet service, but whenever possible, I will join him. It depends on location, location, location ! 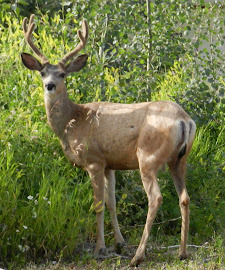 This was in a small but beautiful RV park in downtown Hudson's Hope, B.C., Canada for work in June. The deer wander at large so the park owner has used wire cages to protect the shrubs and bushes. The flowers in the pot hanging on the RV only lasted one day before it was missing all the blooms, someones evening treat.